Kyo is an avid cheerleader of creative, community-building ideas and has served on the boards of many nonprofits including 317 Main. She has been taking an indefinite hiatus from her career as an architect to try and help build this community music center into a thriving, positive force in the Greater Portland area and beyond. Originally from Tokyo, she landed here in Maine by way of the San Francisco Bay area, Boston, and New York City, and along with her husband, Craig Schneider, and two teenage daughters, greatly appreciates and enjoys all that this incredible state has to offer. Molly has been part of 317 Main’s Development team since 2012 and she loves helping make 317’s programs possible. Her background is in nonprofit fundraising and communications and she earned a BS in communications at Boston University and an MBA at Antioch University New England. Molly grew up playing the piano and clarinet, singing with a choir, dancing, and listening to all kinds of music. Now she continues to love music and dance and she does lots of it with her two young children. Chris grew up in Maine. He began studying piano at age seven and classical violin at age ten. He graduated from Waynflete School and went on to receive his Bachelor of Science degree in acting from Skidmore College. After college, Chris moved to New York City, where he worked as a performance artist, musician, puppeteer, and on the staff of the Arts at St. Ann’s concert series in Brooklyn. While in New York, he studied with mandolin master Andy Statman. In 1989, Chris founded the band Rust Farm with Boston guitarist John McGann. Rust Farm released two albums, the second produced by bluegrass great Tim O’Brien. Chris has composed, performed, and recorded music for dance, film, television, spoken word, theater, and visual art projects. His songs have been recorded and performed by Adrienne Young, Mark Erelli, Rani Arbo, Carol Noonan, Barnstar!, Northern Lights, Dennis Brennan, Joe K. Walsh, and others. Chris has taught lessons, classes, and workshops in mandolin, songwriting, English Country Dance and traditional Shaker music. He lived in Nashville, TN from 2003-2013, where he founded the band Kindling Stone. Chris returned to Maine in 2013 to work as the 317 Main’s Director of Music Education. Amy spent two decades working as a television reporter for stations in Maine and Boston before finding a dream job sharing stories about the transformative power of music at 317 Main. Amy is also a Master Gardener, a founding steering committee member at the Yarmouth Community Garden, and the manager of the Yarmouth Farmers Market. Amy holds an undergraduate degree from Connecticut College and a MSJ from Northwestern University. Amy is a ukulele student at 317 Main where she will always be a beginner. She and her husband, Tux Turkel are raising their son Zach in Yarmouth. Contact the Front Desk for general information, lesson registration, and scheduling at (207) 846-9559 or use our Contact Form to send an email. Fred is a lawyer concentrating in intellectual property law. He took music lessons and participated in several groups at 317 Main for 5 years before joining the board. Fred says he plays left-handed mandolin imperfectly but with a decreasing level of futility. He and his wife, Polly, live in Cumberland and have two grown sons. Nancy is the Partnership Coordinator for King Middle School in Portland. She takes guitar lessons at 317 and has a passion for music and the arts. Gail has decades of experience bringing worthy causes to life. She was the Executive Director at The Center For Grieving Children and past Board President for the Spannocchia Foundation. 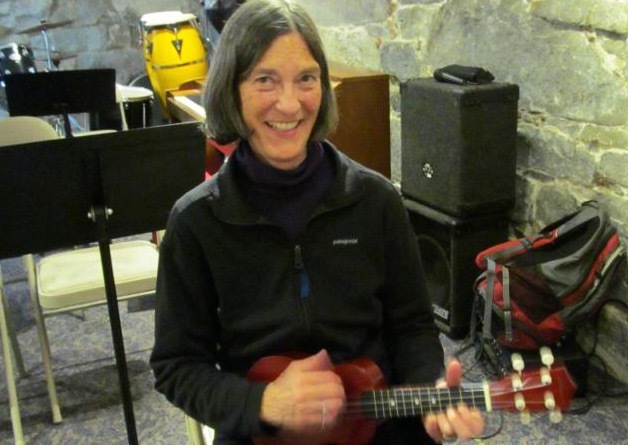 Gail also started The Yarmouth Community Garden as well as a smaller community garden on Squirrel Island in Boothbay Harbor.She is the mother of 2, Grandmother of 4 and currently a beginning ukulele student at 317 Main. John has been in the investment advisory and management field for more than two decades. He currently is a partner and owner in Cribstone Capital Management, a registered investment advisory firm based in Brunswick and Cumberland. An avid fan of outdoor activities from cycling to hiking to snowboarding, he and his family enjoy all that New England has to offer. A beginning mandolin player, he and his fiddle and violin-playing daughters Maggie and Teagan live in Cumberland Foreside. Shari Elder is a Meeting and Event Planner whose passion project is the Thomas Point Beach Bluegrass Festival in Brunswick. She has taken fiddle lessons at 317 Main andhopes to again. Shari, her husband and their twin daughters live in N. Yarmouth. After a successful career in leadership roles at several companies, Maine native Peter Haynes turned his attention to the non-profit world. He has shared his business acumen on boards for the Boys and Girls Club of America, the Portland Symphony Orchestra, Maine Medical Center and the University of Maine. Peter has played piano and sung in choirs since childhood. By joining the board at 317 Main, he hopes to help others discover the joy and relaxation that comes from playing and listening to music. He and his wife, Judy, live in Yarmouth. They have three grown sons and seven grandchildren. Clayton is a founder and the CEO of CLYNK, an innovative container recycling company that is available at Hannaford Supermarkets throughout Maine and through licensees in Oregon and New Brunswick, CA. He is also an owner and board member of Maine Hardware in Portland. He and his wife live in Freeport. As a young man, Neil Lamb earned a degree in music and then spent 30 years managing a lumber business. He sold the business in 2004 and is most grateful to pursue music full time again. He is a native of Brunswick where he lives with his wife, Cathy. Hans has been a 29 year resident of Yarmouth and a guitarist for over 50 years. Having been brought into the 317 orbit by its founder, Peter Milliken, he now thinks it is the best original idea any friend of his ever had. Hans served on the Board of the Maine Island Trail Association for several years. He has been a Trustee for many years of the Portland Museum of Art and is a past Chairman of the Board. Professionally, Hans is an investment advisor with Janney Montgomery Scott. Drew Watt is a Senior Vice President & Portfolio Executive at TD Bank. He joined the board to help support the role that 317 Main plays in the local music community and to bring his non-profit business experience to assist this great asset. He loves music of all kinds, and his daughters, Amelia and Cassie, have both been active in lessons at 317 Main. Drew, his wife Sarah Cotsen, and their girls live in Yarmouth. Justin Whitlock is a longtime board member and past board chair. He has studied guitar at 317 for several years. Both of his children are musicians and his daughter, Adrianna, currently plays bass in Flight 317, an instrumental group comprised of advanced students. Someday Justin hopes to play an F chord comfortably. He works for an IT firm in Portland, and he and his family live in Yarmouth. Jeff White worked as an attorney with Pierce-Atwood for 39 years. Now retired, Jeff is an avid cyclist, skier, grandparent and member of Unspent Youth, 317 Main’s Deep Roots ambassador band. Jeff and his wife live in Cape Elizabeth.